Ministry of Propaganda - 03/Sep/2006: "2 Parents, 1 Kitten and 1 Canal"
Turns out the weather forecast was wrong again: While it was quite wet early in the morning it cleared up mid morning and was really nice until later in the afternoon. Meaning we were able to go on to the Sunday Canal and Pub Walk I had planned. 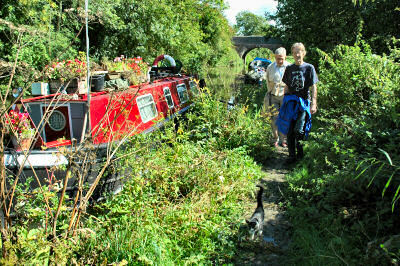 We left from Wootton Rivers some time between 11:00 and 11:30, following the old towpath along the canal. The sun came through more and more, making it very pleasant walking in mild temperatures. It was still quite windy, but the trees along the canal provided sufficient shelter. 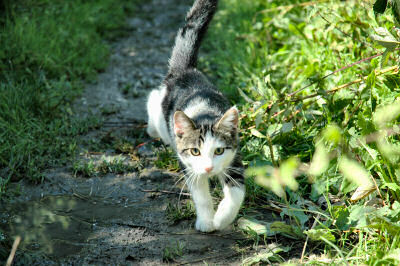 Somewhere along the route, I think near New Mill, I was given the opportunity for some material for traditional blog content: Kitten pictures! I think it belonged to one of the canal boats, at least that's where it came from: A kitten joined us on the path, wanting to play and generally being very photogenic. It followed us for quite a while until it finally left us and turned around. 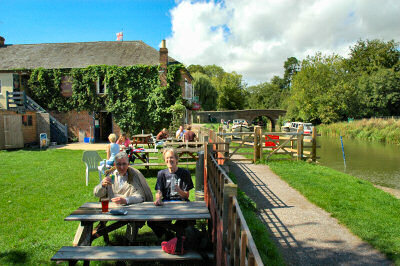 We arrived at The Waterfront , Pewsey Wharf, just before 13:00, perfect timing for lunch. My mother and me had some very nice chicken while my father had a lasagne. Refreshed we started the return leg of our walk at just before 14:00. Same as during the walk I had completed in February we crossed the canal at Pains Bridge and then walked towards Wootton Rivers through Sunnyhill Farm, West Wick, Rook Grove and Clench. Only obstacle was that the path was pretty much blocked between Rook Grove and Clench as the path had disappeared under a maize field. But we managed to navigate through and around it, arriving back in Wootton Rivers just before 16:00.